I will NOT be watching the Taylor Swift version of Cats! 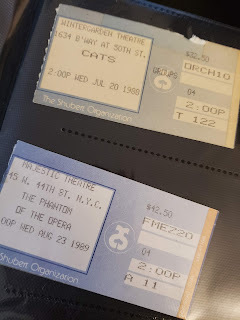 That article scared the crap out of me.....see Cats, was the VERY FIRST Broadway Musical that I ever saw - it truly has a unique place in my mind and my heart because it was something that was "the first." Funny thing was, I read this article and it made me remember that trip to New York and seeing it live so I went to grab my ticket book and BAM I realized that I saw Cats! Now and Forever, exactly 30 years ago TODAY! It was not my first time to New York, but it was my first Broadway musical. I didn't care that we were near the back of the theater we were there to see something that had been a part of my imagination for nearly half a decade. I knew the songs, I knew the music. I had worn out that double-cassette soundtrack! I knew it!!!! I remember sitting in the theater, since we were towards the back we were right up against the scenery, there were set pieces all around the theatre to make you feel as though you were in a junkyard with a bunch of singing kitties. Even though we were just a few rows from the back wall, the stage had never felt closer to me. Cats is one of those shows that I will never ever see live again, only because seeing it again would overwrite the version that is so crisp (and cloudy) in my mind. I can only imagine what it would look like in a huge behemoth of a theater like the Cadillac Palace in downtown Chicago, the distraction of the room itself is enough to pull you out of the suspension of disbelief. I didn't see the "movie" version of the stage production they did in the 90's (except for Elaine Paige as Grizabella). And I sure as hell won't be seeing this monstrosity of a movie either. You'll see from the ticket below Cats, I fixed that issue with being in the back of the theater - for Phantom I was sitting front row of the balcony - and that's still my favorite seat.